Let’s Do It! 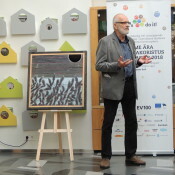 World in co-operation with Haus Gallery opened an exhibition and an international auction today, where 35 well-known Estonian painters contributed their works to raise money for a world-wide clean-up day in 2018. 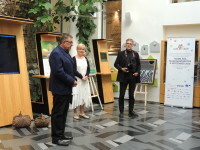 The profits of the exhibition-auction, opened today at the State Forest Management Centre (RMK) will be donated to a worldwide clean-up day organised by Let’s Do It! World and held on the 8th of September 2018. On that day, 150 countries will be participating and cleaning up waste. This will also be one of the international highlight-events of the Estonian Republic 100th anniversary. Let’s Do It! movement started in Estonia in 2008 when 50 000 people cleaned up the entire country and 10 000 tons of waste in just five hours. Let’s Do It! has since grown into an international civic movement with more than 16 million participants. Jüri Arrak, Toomas Vint, Laurentsius, Mall Nukke, Jaan Elken, Tiina Tammetalu, Kamille Saabre and many more have presented their work for auction. 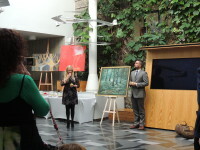 The exhibition consists of nearly 50 paintings; of which many have been specially made to support the Let’s Do It! movement. In the exhibition, the artists speak about important environmental issues affecting society and share their vision of a clean world through their paintings. 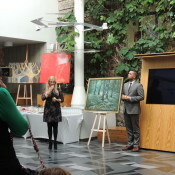 About a dozen of the art works are exhibited at State Forest Management Centre and the majority of them can be enjoyed at Haus Gallery. “The last years, while we’ve been working with Let’s Do It! have given me the confidence that a lot can depend on small simple deeds. The contribution of every painter and art buyer is therefore crucial. 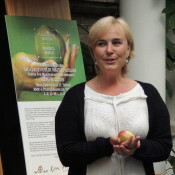 Even the flap of the wings of a butterfly can change the world and even the smallest contribution can kick-start a major process”, said Eva Truuverk, one of the initiators of the movement and Member of the Board of the Let’s Do It Foundation. The exhibition is open at the Haus Gallery (Uus 17, Tallinn) and at the State Forest Management Centre (Toompuiestee 24, Tallinn) from 8th of September to 8th of October, Monday to Friday 10–18 and Saturday 11–16. The exhibition is free for all the visitors. The paintings can be bought from online auction environment www.haus.ee/oksjon during one month from 8th of September to 8th of October 2016. 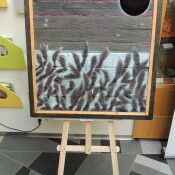 The exhibition “Puhastatud maailm. Purified world” and the auction is organized by Let’s Do It! 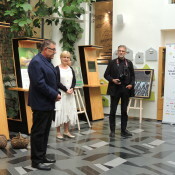 World and Haus Gallery, co-organisers are the State Forest Management Centre, Äripäev and Papyrus. Let’s Do It! World is supported by the Estonian Ministry of Foreign Affairs from the Development Cooperation and Humanitarian Aid fund, EV100, EAS, Tallink, Skype, DHL Estonia, Zavod BBDO, Jobbatical, PricewaterhouseCoopers, Sendsmaily. Let’s Do It! Estonia is supported by Radisson Blu Hotel Olümpia, Infovara, HansaRaama, Meedius Estonia and Telia. Participating artists: Vano Allsalu, Siim-Tanel Annus, Ivi Arrak, Jüri Arrak, Jaan Elken, Herlet Elvisto, Ashot Jegikjan, Eva Jänes, Ivar Kaasik, Rene Kari, Liis Koger, Liisa Kruusmägi, Inge Kudisiim, Andro Kööp, August Künnapu, Laurentsius, Ivika Luisk, Helle Lõhmus, Lilian Mosolainen, Stina Murakas, Mall Nukke, Juss Piho, Jane Remm, Mari Roosvalt, Uuno Roosvalt, Tarmo Roosimölder, Kamille Saabre, Sven Saag, Krista Sokolova, Anatoli Strahhov, Maret Suurmets-Kuura, Tiina Tammetalu, Valev Sein, Toomas Vint, Mihkel Vorsman.